We know — you love your boo. And as much as heart-shaped pendants, a dozen roses and chocolate Hershey’s Kisses sweep us off our feet, we want to feel good from the inside out. Nothing is better than treating your mind, body and soul with a relaxing spa service. We vote this is the best way to express your love for each other. You’re in luck: If you’re traveling with your sweetie, you can experience the best spas in Las Vegas for Valentine’s Day. Enjoy, you lovebirds! This photo alone sends us to bliss. Drift Spa, photo courtesy of Palms Place. At Palms Place, you can drift away, drift away, drift away to Drift Spa. These swoon-worthy Valentine’s Day specials are available through the end of February. Toast your bodies to the spa’s 50-minute champagne couple’s massage, which incorporates a champagne-scented lotion. Hey, we’ll cheers to that. A co-ed, modern-day Roman bathing ritual? We’ll take it. 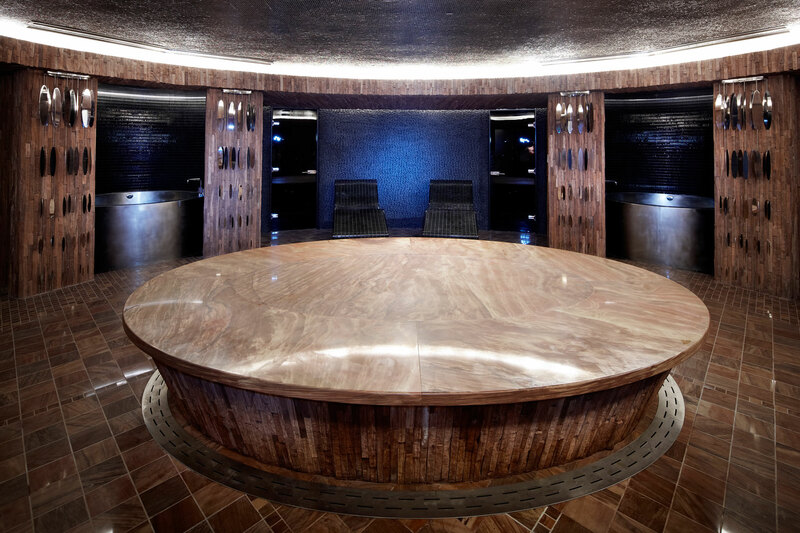 Reliquary Spa, photo courtesy of the Hard Rock. 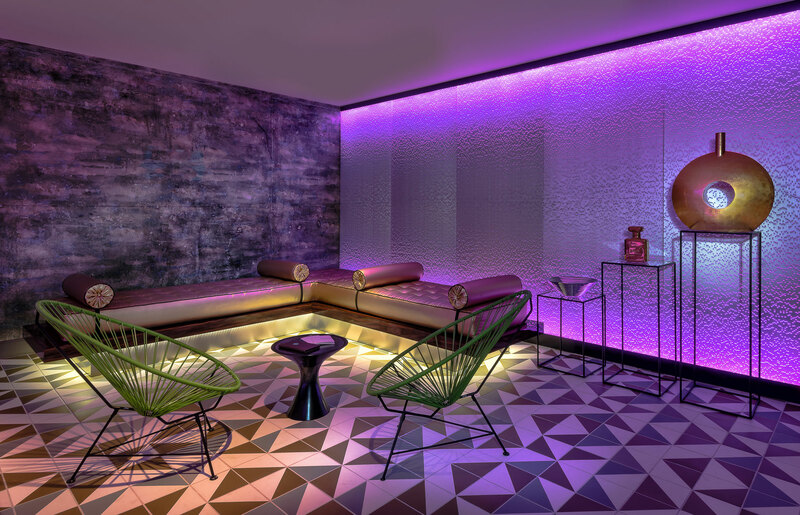 You and your boo can rock out to a different beat at Hard Rock’s Reliquary Spa. From Feb. 12 – 14, the spa offers an All About Us package. This includes a 50-minute massage, two glasses of champagne and chocolate strawberries. This package is $350 per couple. Or, go with the Heavenly Touch massage, which makes you feel good from head to toe. For $205 a person, it comes with a 50-minute Rock Star massage (a Swedish massage using long rhythmic strokes); a 25-minute mini-facial (given during the last half of the massage); and a glass of champagne. Pick a chair, any chair. Then kick back and relax all day. Photo courtesy of Aria. The Spa at Aria has the perfect service if you’re planning a night out. The Couple’s Valentine’s Day package includes a complimentary flute of champagne to celebrate the occasion. This package includes a Weightless Royal Blow-dry for the ladies. It starts with a hair mask designed to seal split ends and leave the hair healthy and shiny. The service ends with a blow-dry and style, leaving the hair with looking full and gorgeous. For the fellas, the package includes a Royal Shave from the salon’s barber. They recommend adding a mask to the service to hydrate the skin, which leaves it nice and refreshed. The Spa at Aria also offers the 100-minute Ultimate Valentine Manicure and Pedicure. This mani-pedi soothes, hydrates and nourishes the skin. It also comes with champagne, truffles and a complimentary gift. 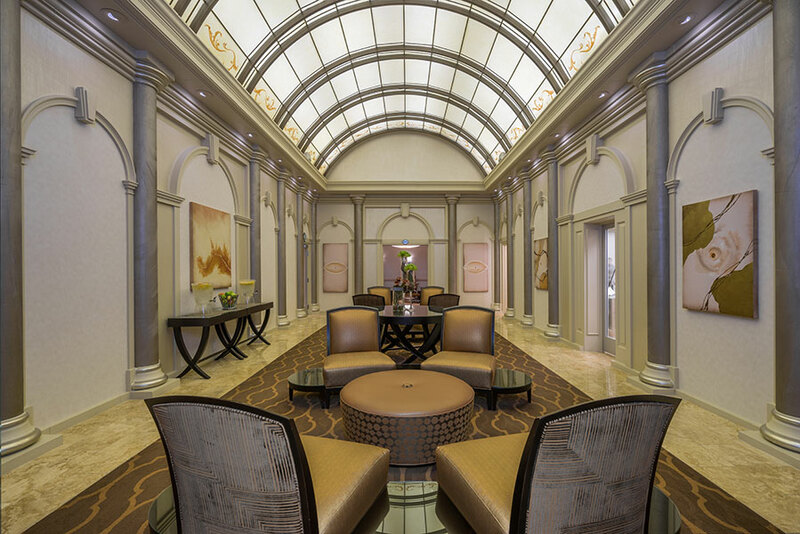 If you’re staying downtown, the Spa at Golden Nugget leaves you in good hands. The spa spent $800,000 to improve the facility. Try the 80-minute Sweet Love Scrub and Massage, which includes an invigorating honey lavender sugar scrub followed by a full-body relaxation massage. You’ll leave smelling awesome too. There’s also the 80-minute Hugs and Kisses Manicure and Pedicure service. These February specials are available from Valentine’s Day until the end of the month (Monday – Thursday only). Stretch out and relax with your sweetheart in the spa’s hammam. 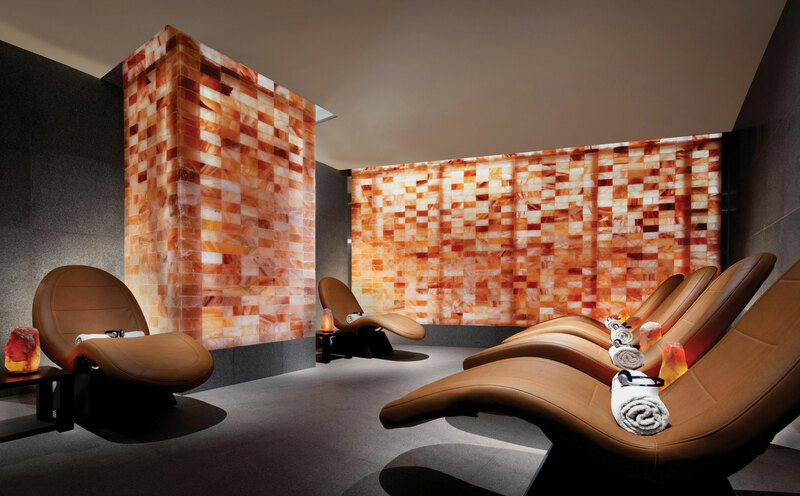 Sahra Spa & Hammam, photo courtesy of The Cosmopolitan of Las Vegas. Take your soul mate to Sahra Spa & Hammam at The Cosmopolitan of Las Vegas and try the Valentine’s Sahra Suite package. It offers four hours in a Sahra suite, a 50-minute couple’s massage, a side-by-side 80-minute Red Flower Hammam Experience, a bottle of Veuve Clicquot and a chocolate covered strawberry amenity. Guests will also receive a Sahra robe and Red Flower Hammam gift to take home. The package is available Friday, Feb. 12 through Sunday, Feb. 14. Additionally, if you book a 50- or 80-minute couples spa service, you’ll get to take home a Sahra spa robe. (If you ever slipped into a spa robe, they’re like the cuddliest things ever.) And if you book an additional hour in the Sahra Suite, you’ll get a complimentary bottle of Veuve Clicquot (worth $250). She’s not alone… maybe her boo is the one taking the picture. Costa del Sur Spa, photo courtesy of South Point. 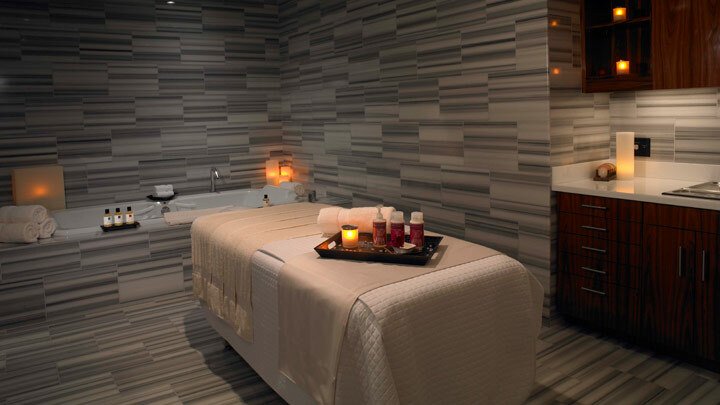 South Point’s Costa del Sur Spa isn’t too far from the Strip and we say it’s worth the drive. Costa del Sur Spa celebrates Valentine’s Day with luxurious and romantic couple’s specials through the end of the month (available Monday through Friday). For you sweetie pies who book a couples treatment, you’ll have access to the exclusive couples spa. It comes with its own Jacuzzi, steam room and sauna. The 80-Minute Chardonnay and Fig Couples Retreat comes with a side-by-side Tuscan fig manicure and pedicure. Stay in the private couple’s room and enjoy the oversized Jacuzzi infused with Olavie’s Private Reserve Chardonnay Bubble Bath. Get touchy feely by exfoliating one another with Olavie’s Tuscan Fig Sugar Scrub. Next, you’ll relax side by side with a massage. Your therapists will use Olavie’s Chardonnay massage oil, designed to eliminate muscle tension. This service ends with a feet and hands exfoliation. Toast with a complimentary glass of chardonnay while unwinding during a manicure and pedicure. Costa del Sur also offers a 50-Minute Romantic Getaway Couples Massage and 50-Minute Couples Facial. This romantic getaway includes a 50-minute Swedish massage. Next, you’ll have a side-by-side facial fit for your skin type. The complete service is $500 per couple (not valid with any additional specials or discounts). 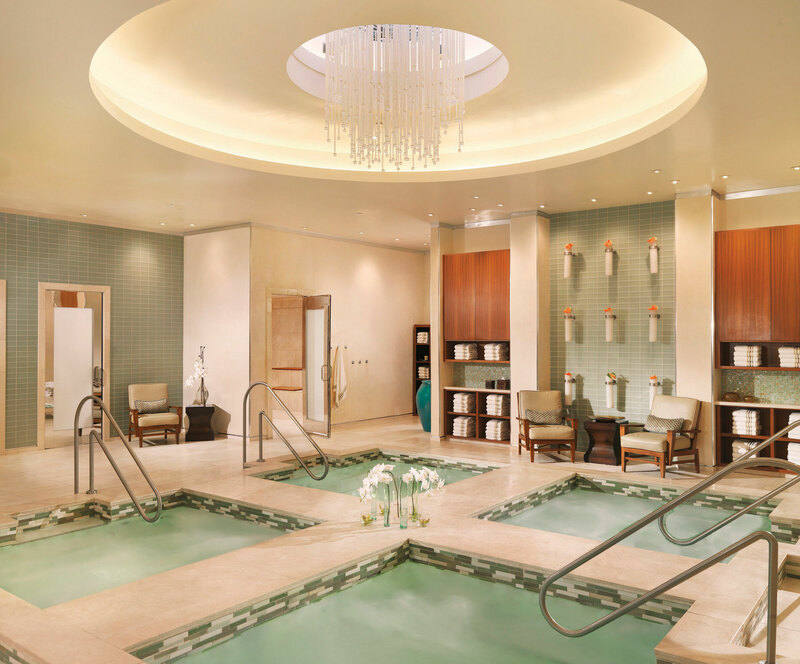 So fresh and so clean (clean): The Spa Bellagio features gorgeous and elegant design. Photo courtesy of Bellagio. If you’re already a fan of Bellagio. then you’ll love the spa and its specials available now through Feb. 29. Enjoy the 50 or 100-minute lavender hot stone massage, which includes a full body hot stone massage and a lavender salt scrub. Like we mentioned earlier, we have nothing against a dozen roses. But the spa’s Valentine’s Day Bouquet manicure and pedicure is where it’s at. This aromatic service incorporates orchids, roses, and neroli blossoms to nourish, soothe and protect dehydrated skin. These luxurious florals provide your skin with a natural source of vitamins and minerals to smooth, soften and leave you glowing. It also provides a boost of powerful antioxidants, which protect the skin against free radical damage and premature aging. Imagine if a spa had a hip little sister — The LINQ would be it. Photo courtesy of Caesars Entertainment. Another super relaxing spa photo. Photo courtesy of Trump Las Vegas. The Spa at Trump Las Vegas has a Romance Package running through the end of February that includes a luxurious couple’s massage and chocolate-covered strawberries for guests to enjoy in their room. We’re huge fans of the spa attachés. It’s like your own personal spa concierge. They’ll assist you with everything, from providing you with teas and refreshments to making your entire spa day as personalized and comfortable as possible. Cheers! All smiles here. We owe it to ourselves to get pampered this Valentine’s Day weekend. 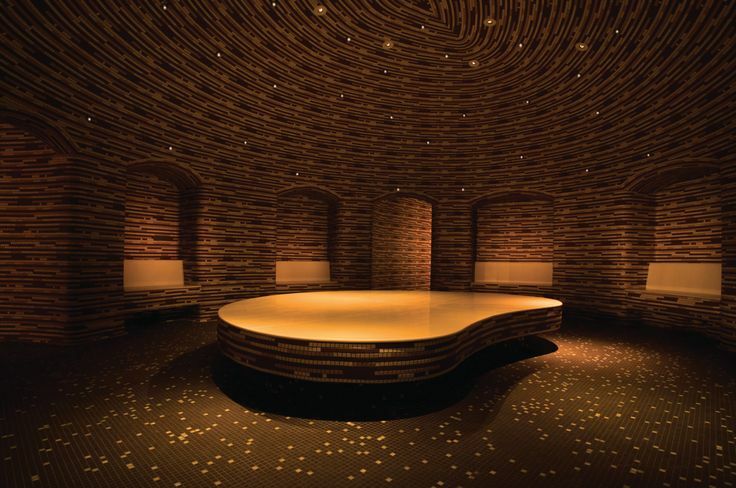 Reliquary Spa at Hard Rock: You can hang out together in the co-ed Roman bathhouse. Make sure to bring your swimsuits so you can take a dip together in the indoor pool. Ciel Spa at SLS: They have intimate relaxation nooks where you can draw the curtain and feel like you have the spa all to yourself. Each nook has two seats with accompanying ottomans. We love how they serve complimentary chocolate chip cookies — something you don’t typically find in a spa. 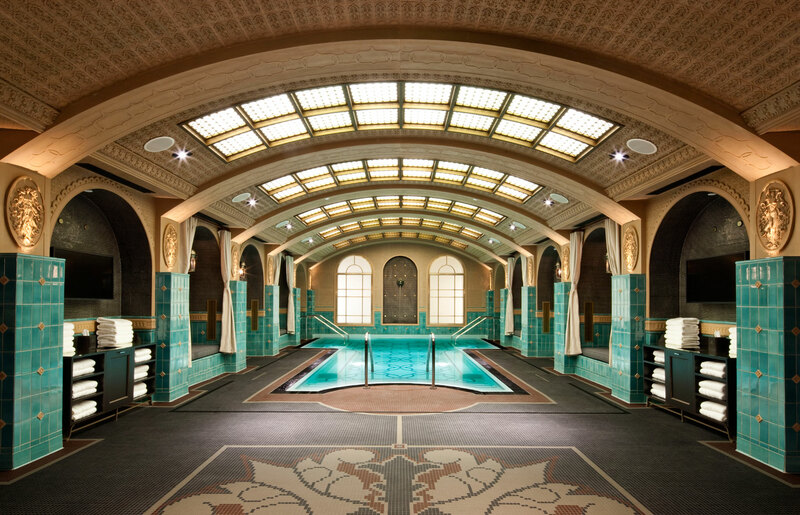 Canyon Ranch SpaClub at Venetian & Palazzo: The Rasul chamber is a popular choice for couples. Here’s a quick lesson: You’ll be in a steam room (that fits two) and have the chance to massage therapeutic mud on each other. One nice touch is the dim lighting and tiny lights on the chamber’s ceiling. The spa at The LINQ: Depending on availability, squeeze in an extra 45 minutes to experience its Himalayan salt therapy cave. Natural salt caves are said to aid congestion, asthma and sinus issues. You’ll have to call in advance (702-794-3242) to book your time. Costa del Sur spa at South Point: The spacious relaxation room is co-ed and even has a TV (on the lowest volume to keep its peaceful vibe). You can also order breakfast, salads, wraps, sandwiches and beverages. And by beverages, we mean champagne, Bloody Mary cocktails and mimosas. We can make this spa trip an all day thing. Make the most of your Vegas Valentine’s weekend, try some unique and funny Valentine’s Day activities or check out the rest of our spas.